This is the fourth and final posts in a series of posts written by students from my third year Evolutionary Parasitology unit (ZOOL329/529) class of 2016. This particular post was written by Sierra Weston and it is about how male Tungara frog end up receiving a parasitic present while trying to call out to female frogs. (see also the previous post about picky bat flies, monkey-infesting botflies, and the caring maternal side of a parasitoid wasp). 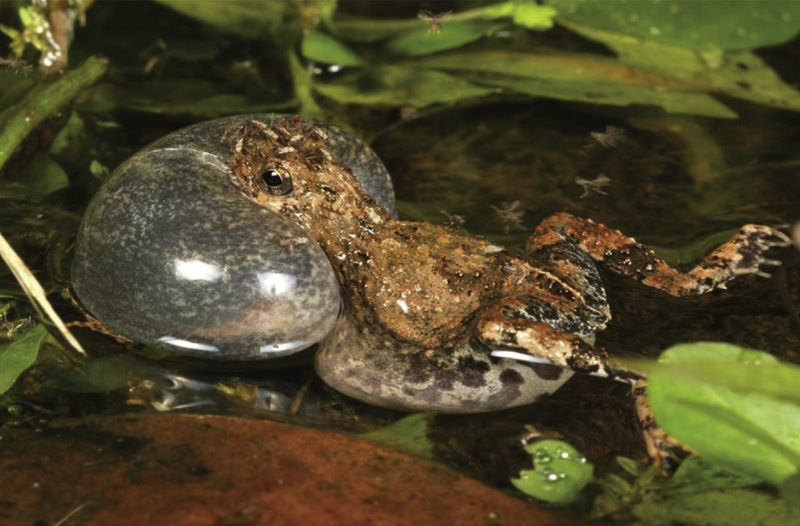 Like many species of frogs, during breeding season the males of the túngara frog produce a mating call to attract female frogs. But instead of just serenading his own species, the male frog may inadvertently be announcing his location to nearby frog-biting midges. All adult frogs are at the mercy of a range of opportunistic and specialised insects, some of which are potential vectors for all kinds of blood parasite. There is a species of frog-biting midge (Corethrella spp.) which preys predominantly on the túngara frog (Engystomops pustulosus) - a species of small frog found in the region between the south of Mexico to northern South America. The female midge takes advantage of the male frog’s mating call during their breeding season as a host detection system. The midge follows the sound, finds the frog and voila, it gets a blood meal. A male can attract up to 511 midges in half an hour. Unfortunately, again for the poor frog, midges are the perfect vector for a wide variety of diseases and parasites including trypanosomes. Trypanosomes are single-celled protozoan parasites that infects hosts from all vertebrate classes; birds, mammals, reptiles, fish and amphibians. Some of these protozoans can cause diseases, including sleeping sickness (Trypanosoma brucei gambiense), in humans, as well as making their hosts more susceptible to sickness. Although frog trypanosomes are a less studied group, there are some parasite-vector-host relationships that have been documented. The study featured in this post investigated trypanosome infection in túngara frogs. The aim of the study was both to determine that trypanosomes affected the túngara frog and identify the species of parasite if present, and whether there is a difference in trypanosome prevalence between male and female frogs. Since it is the males that produce the mating call, it was predicted that any midge transmitted trypanosomes would only occur in male frogs. The researchers confirmed the presence of trypanosomes in the blood of the frogs, but also observed that the parasites possessed a some unique characteristics that set them apart from previously described species. However, frog trypanosomes are also known to be able to significantly change their shape when infecting different hosts. This presents the possibility that the trypanosomes infecting the túngara frogs could be a previously identified species with a slightly altered form which make them more suited to life as a parasite in the túngara frog. Through further analysis and DNA sequencing, researchers were able to confirmed the discovery of a new species of trypanosome: Trypanosoma tungara. In terms of prevalence in male and female hosts, results showed a much greater percentage of males infected with trypanosomes showing that the mating call results in the male frog being the ‘easiest’ and most predominant target for the frog-biting, trypanosome vectoring midges. There were also female frogs infected with trypanosomes, which was surprising because female frogs do not vocalise. A potential transmission path is presumed to be the close proximity of the frogs when they are in amplexus, (the mating ‘embrace’) which allows the midge to move directly from the male to the female frog. This post was written by Sierra Weston. That wraps it up for ZOOL329 class of 2016 - I would like to thank all the students for their posts! Next month, it's back to writing my usual posts about newly published parasite-related papers which you might not have noticed, and/or papers that were not as widely covered by the press - so stay tuned for more! This is the third post in a series of blog posts written by students from my third year Evolutionary Parasitology unit (ZOOL329/529) class of 2016. 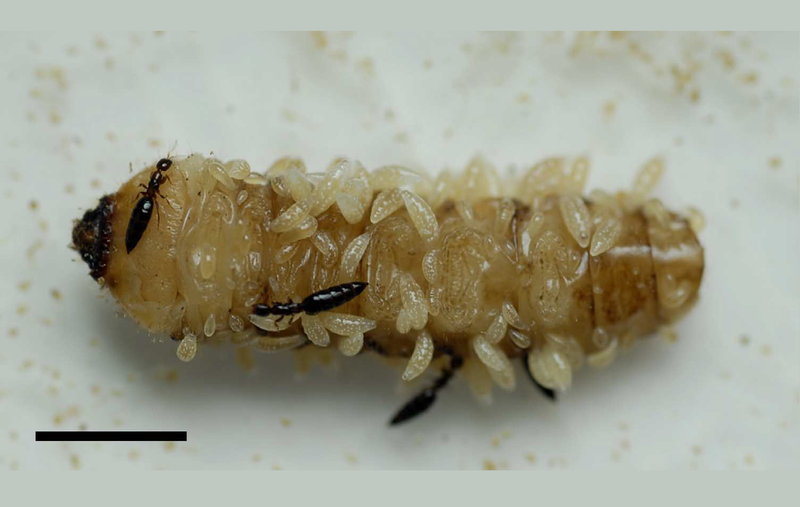 This particular post was written by Jarrod Mesken the more maternal side of a parasitoid wasp (see also the previous post about picky bat flies and monkey-infesting botflies). When most people think of parasite behaviour, horrific tales of behavioural and physiological manipulation are what come to mind. This is not without cause; many parasites are definitely scary to think about. However, many pursuers of the parasitic lifestyle also display behaviour that would be thought of as normal, perhaps even charming in an anthropomorphic kind of way. An example of this is seen in the parasitoid wasp Sclerodermus harmandi, in the form of maternal care. This stories begins when the female wasp finds a suitable host for her eggs. She injects the host with paralysing venom, and cleans an area of the body to lay eggs on. Once laid, she routinely inspects the eggs with her antennae and mouthparts. If an egg is found to have detached from the host, she would gently reattach it. Maternal behaviour continues when the eggs hatch, when the larvae must be fed. To do so, the mother wasp bites a hole in the host, which is still alive at this point and injected with paralysing venom periodically to prevent it from moving. The hole fills with haemolymph, the insect equivalent of blood, which is consumed by the larvae. During this stage the mother S. harmandi also moves the larvae around to prevent them from overlapping each other as they grow. If a larva dies, the mother moves the body far from the other larvae to prevent their habitat becoming unsanitary. Even during the cocoon stage the mother continues to rub the offspring, despite them being encased. Eventually, the males of the clutch hatch out as adults. These few males (there is considerable female bias in the ratio of this species) chew holes in the female wasps’ cocoons to assist them in emerging, after which they mate with them. While it has negative affects in many taxa, this kind of inbreeding is less likely to have negative effects in hymenopteran insects, where haploid males act as a purge of deleterious alleles. So why does S. harmandi provide such comprehensive maternal care? Because it increases the likelihood of offspring surviving. Experiments in which the wasp mothers were removed at varying stages of offspring development showed that not only were offspring that received maternal care more likely to survive to adulthood, but that this was proportional to how much maternal care they received. Experiments also showed that when a mother was taken away and replaced with another female who has previously laid eggs, the ‘stepmother’ will exhibit the same behaviour as the mother would, with the same rise in offspring survival. Why the stepmother expend her own energy to raise another wasp’s offspring is just as interesting; it is because of the high levels of inbreeding in the population. Since most of the reproduction in this species is done through inbreeding, there isn’t much genetic variation going around. This means that there is a good chance of two wasps being related, so the stepmother may increase the chance of her genes being passed on by raising another wasp’s offspring. Female S. harmandi that haven’t laid eggs yet do not exhibit this behaviour, preferring to leave the offspring alone; this would indicate that the maternal behaviour is initiated by laying eggs. So for a parasitoid wasp, it turns out that the females of S. harmandi make for very responsible parents or stepparents. That is, if you consider letting your children live on the body of something you paralysed, feeding off its blood until they grow up, and then mate with each other to be “responsible”. Hu, Z., Zhao, X., Li, Y., Liu, X., & Zhang, Q. (2012). Maternal care in the parasitoid Sclerodermus harmandi (Hymenoptera: Bethylidae). PloS One 7: e51246. This is the second post in a series of blog posts written by students from my third year Evolutionary Parasitology unit (ZOOL329/529) class of 2016. This particular post was written by Gabrielle Keaton and it is about a nasty botfly that lives in the neck of howler monkeys (you can read the previous post about picky bat flies that live on bats here). You know how itchy a mosquito bite can be - you scratch it then a lump forms. Imagine that lump forming but not going away. Instead, it grows and grows inside of you until finally a black grub plops out of a hole in your neck onto the ground. Well that’s what it’s like for the howler monkeys of Panama! This nasty parasite in this case is the larvae of Alouattamyia baeri, a botfly that lives on free-ranging howler monkeys (Alouatta palliate). In a study conducted over seven years from 1987 to 1993, researcher Dr Katherine Milton investigated a variety of factors relating to this parasite's life cycle including its infection prevalence and intensity. She found that 60% of the howler monkeys on Barro Colorado Island (BCI) were infected by this botfly. Alouattamyia baeri are large (18 to 20mm in length) black flies. The adult fly sounds and look like neotropical bees. When flies that were collected from the howler populations on BCI were reared in captivity, it was found that female flies produced an average 1400 eggs each, laid in discrete rows. These eggs required the appropriate stimuli (carbon dioxide and heat) to hatch into parasitic larvae that then invade their host through the nose and mouth where it migrates to the neck and opens a up larval pore. The larva reside in the howler’s neck for approximately 6 weeks, passing through 3 instars (developmental stages). After this, the larva drops out of the monkey's neck warble and burrows into the soil where it finishes the last developmental stage underground. The study found that the entire life cycle takes approximately 13 weeks. Dr Milton discovered that most of larval growth (86%) occurs during the 3rd instar when its food consumption increase by about 20%. This means the larva was trying to extract the most resources at the last possible moment of its stay, so if it ends up killing the host, it wouldn't matter to them because they are out of there. Now, I’m sure you might have a bit of a panic next time you feel a little raised bump hanging around your neck, but remember - even if it is a botfly, at least you know it will be gone in 6 weeks' time. 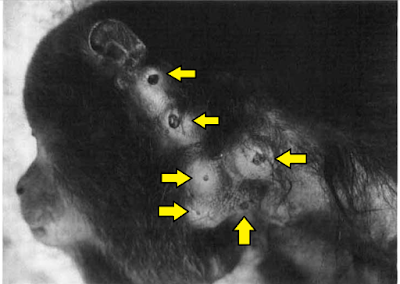 Milton, K. (1996), Effects of bot fly (Alouattamyia baeri) parasitism on a free-ranging howler monkey (Alouatta palliata) population in Panama. Journal of Zoology 239: 39–63. Those who have been reading this blog for a while will know that August is student guest post month! All this month this blog will be featuring posts written by students from my Evolutionary Parasitology (ZOOL329/529) class. One of the assessment I set for the students is for them to summarise a paper that they have read, and write it in the manner of a blog post. The best blog posts from the class are selected for re-posting (with their permission) here on the Parasite of the Day blog. I am pleased to be presenting these posts from the ZOOL329/529 class of 2016. To kick things off, here's a post by Melissa Chenery about some picky bat flies. The public often view bats as repulsive, disease-carrying animals and are subsequently disliked. “Argh! They’re repulsive!” is just one of the many lines I have heard from people walking by while I observed a local colony. But do you know what is even more horrifying than a bat? A bat fly! 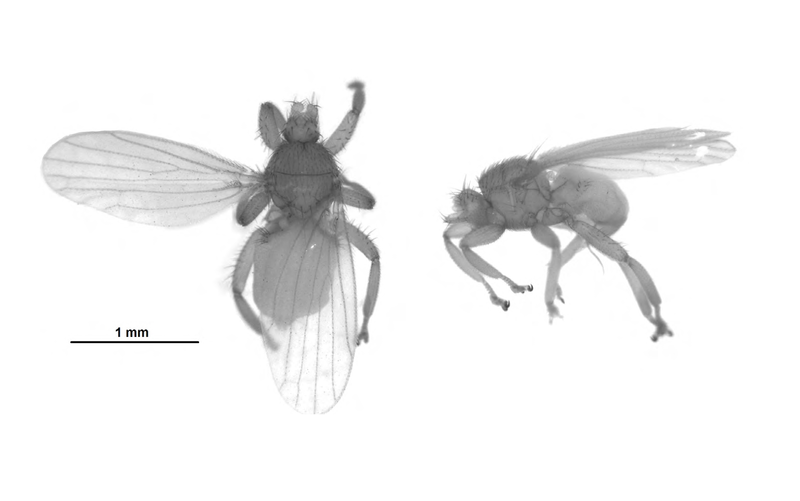 These ectoparasites belong to two families of flies know as Streblidae and Nycteribiidae. But these hematophagous (blood-feeding) parasites don’t always fly like the name suggests - most species actually have no wings at all, and some look more like spiders than flies. Disgusting, right? But not to worry, these external parasites have evolved to feed exclusively on bats. The bat flies are quite specific towards their hosts and tend to stay on a particular bat host. They are even picky about where they live on the host, whether on the bat’s fur or hiding within folded wing membranes. Occasionally they can be found in the fur and these individuals possessed comb-like structures (called ctenidia) for attaching to fur. It is assumed that long-legged species move quickly to avoid being scratched by the bat during grooming, whereas the short-legged species hide within the membrane folds to avoid getting licked. Bats use grooming as a behavioural defence against bat flies and other external parasites, and bats with a high number of flies groom more often than those with only a few. For the parasites, action can result in their removal and often their death. In a study which took place in Belize, Central America, a team of researchers demonstrated just how host-specific the bat flies can be. They examined over thirty two species of bat flies, and in the twenty species for which they were able to collect more than five individuals, they found that eighteen of those species showed strong site preferences. The majority of the bat flies were constrained to a single host-species, and amazingly, bat flies with functional wings (which would allow them to be more mobile) weren't any more or less picky than those without. The study also found that only two species (Trichobius yunkeri and Trichobius dugesioides) weren’t too fussy in respect to host-site preference. For bat flies that were the dominant species of their respective hosts, six out of those seven species were fur-specific, suggesting that in most cases, bat flies are highly host site-specific. They also discovered an interesting correlation between leg length and host-site preference. Bat flies with longer legs are able to push up over the surface of the fur, and are more likely to be found dwelling in fur. Conversely, short-legged individuals moved much more slowly and were mostly membrane-dwelling. The team also conducted a study where three bats were restrained and three left unrestrained, with six bat flies placed on each. All unrestrained bats had only one bat fly remaining after five days, whereas all bat flies remained on the restrained bats. This suggests that the elimination of the flies is due to grooming behaviour. This may also be the cause of host-site specificity in bat flies, although further studies are needed Despite their nightmarish appearance, bat flies can still be very fussy eaters, and they have adaptations which allows them to specialise on particular bat species and host-sites. Hofstede, H., Fenton, M., & Whitaker. J. (2004). Host and host-site specificity of bat flies (Diptera: Streblidae and Nycteribiidae) on neotropical bats (Chiroptera). Canadian Journal of Zoology 82: 616-626.